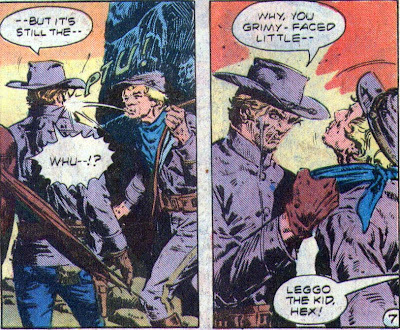 Matching Dragoons: Jonah Hex #55 "Trail of Blood!" 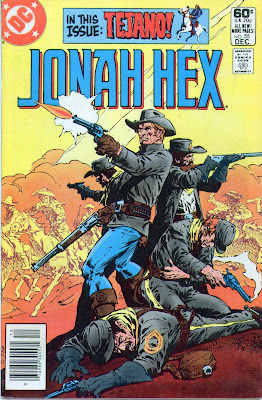 Jonah Hex #55 "Trail of Blood!" The four members of the Fort Charlotte Brigade (Micah, Shenandoah, Pee-Wee, & Timmy) have just sprung forth from the tall grass to put a halt to Jonah Hex's escape from El Papagayo. Carmelita had helped Jonah escape from El Papagayo and now Micah tosses a small bag of money to her, thanking her for leading Jonah into their clutches. It turns out that Carmelita is working not only for the Mexican Army & El Papagayo, but Quentin Turnbull as well. Carmelita is chuckling at have played the winning hand when she is suddenly shot dead off of her horse by the Mexican bandit leader. Papagayo is in the hills above them and shouts down that he intends to kill Hex and the men that are with them. In fact, Papagayo says that if they all surrender now, he will kill them quickly instead of slowly. 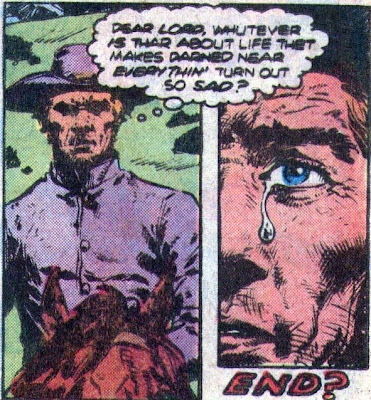 Jonah Hex will have no talk of surrender or even of fighting. He thinks their best chance is running and he lights fire to the tall grass in order to shield their escape with the smoke. The plan works but only delays Papagayo's pursuit of them. The next morning, it is the 12th anniversary of Jeb Turnbull's death. In Richmond, VA, Quentin Turnbull heads out to lay flowers on the grave of his son who died 12 years ago (which was 1863, thus making this 1875. NO!!! Really!?!?!?!) . Solomon puts forth that maybe Jonah is not guilty but Turnbull gently reminds Solomon that he is a good man, but naive. Turnbull then spends some silent time at Jeb's grave. Meanwhile, in Mexico, Jonah Hex & the Fort Charlotte foursome are breaking camp. Pee-Wee suggests killing Hex now, but Micah thinks that they will need Hex's help to get them into the US and away from Papagayo. As they head out, Jonah asks Timmy, a young man, why he is involved in this since he couldn't have been old enough to be involved in the War Between the States. Timmy explains that his dad was killed in the Fort Charlotte Massacre and is planning on avenging his father's death. Jonah explains what really happened at the fort, but Timmy will hear nothing of it and spits in Jonah's face. Jonah grabs Timmy by the collar, but Pee-Wee has leveled his rifle at Hex, demanding he let go. During all of this, Shenandoah has dismounted and has walked forward on the trail to pick up a parrot feather. Jonah shouts a warning but it's too late, Shenandoah falls into a collapsing pit full of sharpened stakes and dies. Jonah grabs Micah's rifle and starts squeezing shots off, killing at least one of Papagayo's men. Several of Papagayo's men ride down on the four remaining men. 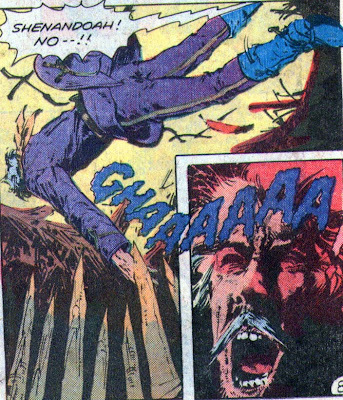 Jonah smashes one bandit's brains in with a rock and then kills another who is trying to kill Timmy. He hears Micah scream and heads over to help him, but Jonah is too late and can only kill the bandit afterward. Finally all of the bandits are dead and Timmy thanks Jonah for saving his life, but Pee-Wee says that Jonah was only saving his own skin and vows that he himself will kill Hex once they cross the Rio Grande. Up in the hills, Papagayo is spying on their departure and despite a henchman's statement that they will escape across the river in a few short hours, Papagayo says that it's all... part of a plan. Hours later Pee-Wee, Timmy & Hex arrive at the Rio Grande at a ferry crossing. They can't find anybody in the ferryman's house (because they are bound and gagged) and decide that they can navigate the ferry across the river. Once they get the ferry loaded and in the middle of the river, El Papagayo shouts from the hills overlooking the river that he is bidding goodbye to Jonah and the other two men. Jonah starts rummaging through the crates on the ferry and finds a bundle of dynamite with a lit fuse. They all jump overboard since there may be more dynamite hidden and the ferry gets blown to splinters. Jonah swims over to Timmy, who is drowning, and drags him ashore. However, Pee-Wee is standing there with his rifle leveled at Hex. Timmy starts protesting that they can't kill Jonah, it ain't fair after everything that Jonah has done for them. Pee-Wee says that what is fair is killing the man that killed their friends and family. Timmy jumps up a grabs a rifle but Pee-Wee guns him down before Jonah can do a thing. Jonah does however end up killing Pee-Wee with a single shot. Timmy is sitting against a rock, gasping his last, telling Jonah how when they get back to Virginia, Timmy will tell everyone what kind of man Jonah really is so they won't keep chasing Hex. Timmy then dies. Jonah buries Timmy and then rides off. Timeline - 1875. This story covers 2 days. I would have liked to have seen more El Papagayo and less of Turnbull. Turnbull gets to be just one note hammered constantly on an out of tune piano, no one can reason with him and he has only one idea, kill Hex. It was kinda nice to see Timmy coming over to Jonah's side, but since this story has a backup story, we didn't get the extra pages that could have been used to give us more of that growing relationship between Jonah & Timmy. Needless to say, this story didn't thrill me as much as it could have. Next Issue: Jonah ends up taking the train to crazy-town. Oh, no! Not Tragic Hex! Yeah, Turnbull just drives me nuts. I'm not quite sure how he can take the moral highroad, considering he seems to be pretty well rolling in money in the impoverished Reconstruction era of the South,and you didn't manage that without a LOT of manipulation.